People with respiratory diseases, including asthma, that make their lungs more vulnerable to ozone may experience health effects earlier and at lower ozone levels than other people. When ozone levels are high, more people with asthma have attacks that require a doctor's attention or use of medication. One reason this happens is that ozone makes people more sensitive to allergens such as pets, pollen, and dust mites, which are common triggers of asthma attacks. Rates have been age-adjusted to the U.S. 2000 standard population. Note: At the time of this update, the BRFSS U.S. dataset did not include an age variable but did include five age categories up to age 80+ (vs. the typical weighting scheme that includes 85+). Comparisons with both weighting schemes were compared using Utah data, and the difference was about 1/100 of a percentage point. In 2011, the BRFSS changed its methodology from a landline only sample and weighting based on post-stratification to a landline/cell phone sample and raking as the weighting methodology. Raking accounts for variables such as income, education, marital status, and home ownership during weighting and has the potential to more accurately reflect the population distribution. Rates have been age-adjusted to the U.S. 2000 standard population. Rates have been age-adjusted to the U.S. 2000 standard population based on 3 age groups: 18-34, 35-49, and 50+. Rates have been age-adjusted to the U.S. 2000 standard population. Only adults ages 25 and older were included in the analysis. This map was made using an interval break method called "natural breaks" where classes are based on natural groupings inherent in the data. Percentages have been age-adjusted to the U.S. 2000 standard population. All ages prevalence includes adult-reported children and self-reported adults who have been told by a doctor that they have asthma and who currently have asthma. Percentages have been age-adjusted to the U.S. 2000 standard population. Age-adjusted to U.S. 2000 standard population. 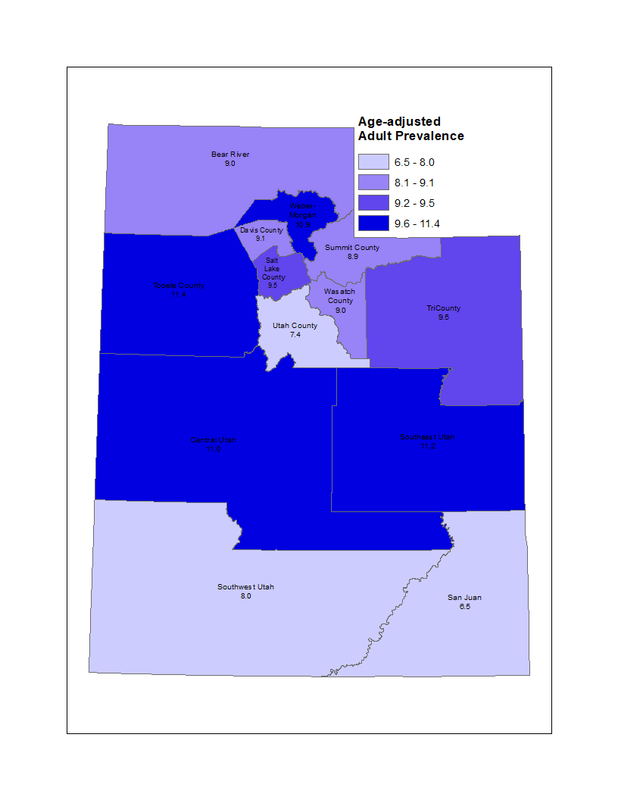 A description of the Utah Small Areas may be found on IBIS at the following URL: [https://ibis.health.utah.gov/resource/Guidelines.html]. *Use caution in interpreting. The estimate has a coefficient of variation >30% and is therefore deemed unreliable by Utah Department of Health standards. The information provided above is from the Department of Health's Center for Health Data IBIS-PH web site (http://ibis.health.state.gov). The information published on this website may be reproduced without permission. Please use the following citation: " Retrieved Thu, 18 April 2019 22:20:26 from Department of Health, Center for Health Data, Indicator-Based Information System for Public Health Web site: http://ibis.health.state.gov ".